Summer is of course, one of the best times for tattoos. People are showing more skin so there’s more opportunity to check out other people’s art and there’s just something about hot weather that makes people want to get a new tattoo. But while all the real tattooing is going on for us adults, we often forget about the little people out there who love showing off their tattoos in the summer as well – even if these tattoos are not of the permanent variety. Yes, I’m talking about temporary tattoos again. Granted, temporary tattoos are nowhere near as interesting as real tattoos. Sure thing, there’s no argument there at all. However, I figured that surely there are tattooed people out there with children and that this piece of news could be of some use to them. Now then, I don’t know about you, but I can appreciate a decent SpongeBob SquarePants temporary tattoo, especially if that temporary tattoo happens to glow in the dark. For their part, kids love it as well. 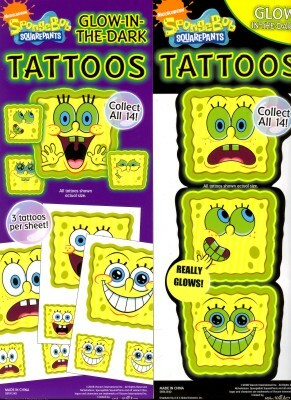 But if you’re a parent of a child who wants to cover his or her body with SpongeBob glow in the dark temporary tattoos, then you’d better take a look at this post over at Montana With Kids. According to the blog, a mother let her two young boys spend their money on SpongeBob SquarePants glow in the dark temporary tattoos. The boys wore the tattoos for a couple of days, but when the time came to remove them, nasty hives and rashes were left behind in the shape of SpongeBob. Thankfully the kids didn’t require any medical treatment other than an over the counter cortisone cream and anti-histamines, but damn – even that shouldn’t be necessary when all these guys were doing was wearing a tattoo of one of their favourite cartoon characters. We’ve seen a far more uncomfortable and serious burning into flesh from black henna, but black henna isn’t something that kids have as much easy access to as temporary tattoos. So if you’re a parent, you might want to be a little more cautious this summer about the temporary tattoos that your kids stick on to their bodies. You never know what’s in those things.